Discover AQUA and all it has to offer. As Tampa Bay's premiere waterfront dining destination, our culinary expertise and exquisite service will entice you to come back again and again . Established in 2012, Chef Joshua Van Hine prepares an innovative menu of global flavors with a true house-made culinary approach in our exhibition-style kitchen. Take a break from routine and feel pampered in our water-inspired, contemporary dining environment. AQUA presents a menu of eclectic, globally-inspired cuisine with a contemporary twist. Chef Joshua Van Hine relies on the freshest, seasonal ingredients while supporting local farms to deliver global flavors. The quality is in the details as we take our scratch-kitchen to the next level in preparing the ingredients for our dishes. Our menu elevates lifestyle dining choices through diverse options: steak, seafood, vegetarian, gluten-free, and vegan. We welcome all discriminating palates to rediscover great food! 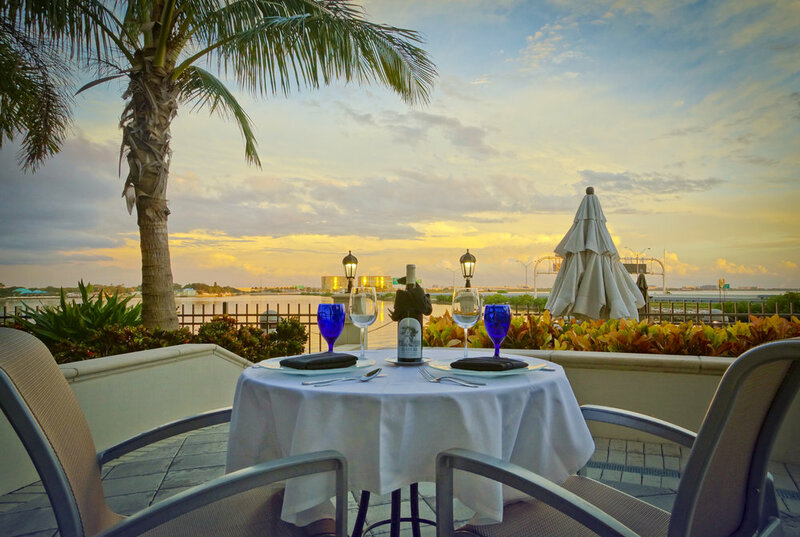 Located on Tampa Bay, AQUA offers a beautiful view of the bay in our dining room and on our patio. As a reflection of the cool vibrancy of the ocean water, AQUA's contemporary look creates a comfortable and unique dining experience for any-day and everyday! Open from sunrise to sunset, AQUA provides the perfect backdrop for any meal or private event. Reservations are available and meal service is provided at our bar, lounge, dining room, patio, and in our wine tower. Hospitality is our business. Discover service that is genuine and welcoming; where our passion for people and food provide a distinct service. At AQUA, we are focused on progressively learning about food and drink in order to share our passion for it with our guests. Come discover the best of global cuisine, award-wining wine, hand-crafted cocktails, exemplary raw bar, and fresh-rolled sushi with us. A native of LaConner, Washington, Joshua Van Hine started his culinary career working at a bed and breakfast in the local town. It was at the age of 14 when he began his life-long journey pursuing a budding passion for everything culinary. Working his way up from dishwashing in his small home town to leading the culinary team at Aqua, he has built a reputation for innovation and creativity in the kitchen. In 2011, Joshua secured a position as a sous chef at Aqua and was promoted to Executive Chef in 2013. Since then, he has been motivating his staff and delighting his guests with thoughtful, inspired dishes. Chef Josh studied Culinary Arts & Sciences at the Culinary Institute of America in Hyde Park, New York. After graduating in May 2006, he interned at a renowned country club in Cape Cod, Massachusetts. It was here that he found the freedom to be creative while running the location’s bistro under the guidance of their executive chef. In order to develop a global culinary perspective, Chef Josh seized new opportunities as they became available. To further his career in the industry, Chef Josh moved to Miami to work for the prominent celebrity chef-owned restaurant, Quattro. Here, he was able to hone his technique for authentic Italian cuisine. After two years, he took a position at the Ritz Carlton in Sarasota where he focused on increasing his knowledge of French cuisine. Then, he moved to the Marriott Waterside in Tampa to focus on Contemporary American cuisine and banquets. Finally, The Westin Tampa Bay welcomed Chef Josh to manage the hotel’s food and beverage operations and he has remained an indispensable asset to the company since. Chef Joshua Van Hine has cultivated a globally-inspired menu at Aqua as a product of his education and experience. Although there is a strong emphasis on global flavor, Chef Josh focuses on sourcing local ingredients such as produce and meat. Additionally, he prepares his own cheeses, cures meats, and grows produce to support his mission in providing the freshest and best ingredients for guests.